If you’ve been told that customer experience is just about making your customers happy, you only know half of the story. The truth is, a great customer experience both makes your customers happy and gets business results. Think about it. Having happy customers, but not making money doesn’t make any sense. Great, your customers adore you, but how will they feel when you raise your prices, or worse, go out of business? The key to crafting any great customer experience starts by clarifying your own business goals. What do you want to achieve? Reduced costs, more cross-sales, less customer support, higher rated products? Then, you need to examine what changes in your customers’ behaviors would promote those goals. After you know want you want and what results you want to achieve, now it’s time to gain a better understanding of your customers. What are their goals, pain points, frustrations? The easiest way is to identify these is to talk to your customers. Don’t ask for a wish list. Rather investigate what they like, dislike and want to do. Explore how they do business with you today and where there is dissatisfaction. Talk to at least eight customers. It will give you enough to uncover the major issues. 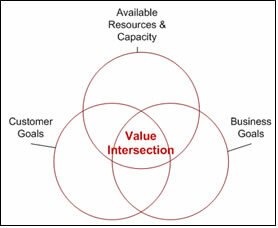 Great customer experiences find the intersection between your business goals and your customers’. When you know what your business wants to achieve and you know what your customers want, now you can identify the intersection. 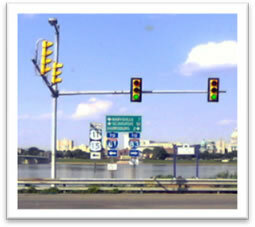 Think about any place where two major highways intersect. What happens? Businesses grow and thrive while tired, hungry travelers are satisfied. This is the power of the intersection. Two major, motivated currents come together to generate results. This too can happen for any business. In essence, you’ve stopped worrying about all the things your customers may want and have begun providing what they do want. You’ve made your customers happy doing exactly what you want. Perfect! So, now it’s just about deciding where to start. It is certain that you will uncover more ideas than you have time or resources to achieve and some of your goals will be easier to achieve than others. So how do you determine what to do first? This is actually very easy in concept. You simply need to find the proverbial low-hanging fruit. First, determine the value. You can measure savings, profitability, likelihood of customer adoption, or other factors specific to your business. Then, estimate the effort to achieve the results. 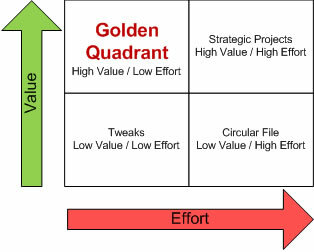 With these two values, you can map them in a simple quadrant diagram. This will help you find your highest return. Those ideas that map the furthest in the upper left are the ones to tackle first. Remember, customer-centric methods keep your customer at the center of your strategy, but these happy customers are irrelevant if they don’t meet your business objectives. So keep your customers in the center of everything you do, but be sure to keep your business in the forefront.